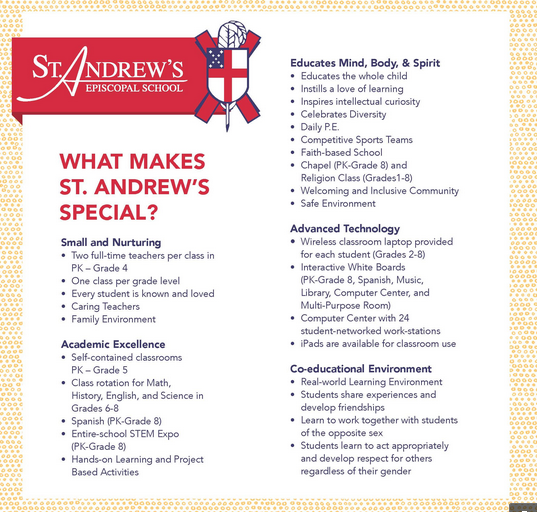 St. Andrew’s recognizes that physical education is essential in educating children. Students are introduced to mindfulness, game play, and circuit training. Teachers encourage students to connect healthy habits of body and mind that will lead to a healthier lifestyle. Through physical education, play, and team sports, students increase their bodily-kinesthetic aptitudes while internalizing the importance and excitement of being physically fit. They also learn problem-solving and teamwork skills that underscore every aspect of a St. Andrew’s education. Every student in Pre-Kindergarten–Grade 8 has daily physical education class. Students in Grades 1–5 also have a morning and afternoon recess, and 6th–8th Grade students have morning break. Students in Pre-Kindergarten and Kindergarten have outdoor play daily in addition to daily P.E. class. St. Andrew’s also fields team sports for middle school competition in the New Orleans Athletic League (NOAL). This past year SAES had 10 teams playing 7 sports: basketball, cross country, flag football, lacrosse, soccer, track/running club, and volleyball. 80% of students in Grades 3-8 participated in sports during the 2017-18 school year and many student athletes participated on multiple teams. Daily physical education classes provide students of all ages with the opportunity to exercise their mind, body, and spirit at St. Andrew’s. Athletic participation in league play is an opportunity for our older students to engage in healthy competition with area schools.